The SeaWolves snapped a five-game losing streak in a big way as they thumped the Harrisburg Senators 15-7 on Thursday night at FNB Field. Erie took the lead against Senators starter Wil Crowe in the second inning. With two outs, Troy Montgomery doubled down the right field line and scored on a Will Maddox base hit for a 1-0 lead. Montomery has now hit safely in 11 of 12 games since returning to Erie from Lakeland. The SeaWolves added to the lead in the third. Cam Gibson led off with a walk and Danny Woodrow singled to put a runner in scoring position. Sergio Alcantara singled home Gibson for a 2-0 lead. Isaac Paredes then doubled home a pair for a 4-0 lead. 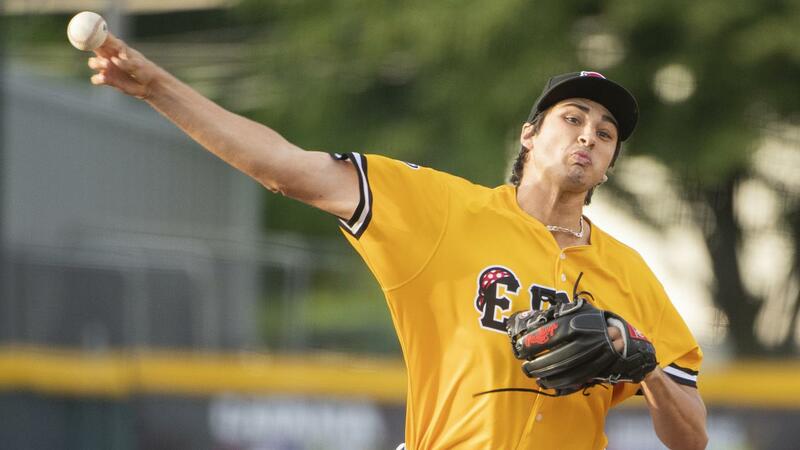 Harrisburg struck back in the fourth against Erie starter Alex Faedo. Daniel Johnson led off with a single and stole second. Raudy Read followed with a walk to put a pair on ahead of Dan Gamache. Gamache doubled home both baserunners making it 4-2. Gamache moved to third on a wild pitch and scored on a Jake Noll sacrifice fly making it a one-run game at 4-3. The 'Wolves continued to swing the bats in the fifth. Alcantara led off with a single and Josh Lester singled with one out to put a pair on. Dominic Ficociello followed with a walk, loading the bases. Jake Rogers hit a ground ball to short that was booted by Carter Kieboom, allowing two runs to score for a 6-3 SeaWolves lead. Montgomery walked to re-load the bases and Maddox grounded out, plating Ficociello for a 7-3 lead. Gibson capped a five-run inning with a two-run single making it 9-3. Erie again added to the lead in the sixth. Woodrow led off with a double and Alcantara singled to put runners on the corners. Paredes reached on an error, plating Woodrow for a 10-3 lead. Lester singled home Alcantara making it 11-3 and Rogers brought home Paredes on a sacrifice fly making it 12-3. The Senators cut into the lead in the sixth against reliever Andrew Schwaab. Gamache and Noll each singled with one out. With two outs, Drew Ward and Hunter Jones each singled home runs to make it 12-5. Kieboom would later single home Ward to make it 12-6. The 'Wolves went back up by nine runs in the top of the seventh. Gibson led off and reached on a catcher's interference and Woodrow was hit by a pitch. With one out, Paredes sent a line drive home run over the wall in left to make it 15-6. The home run was his third of the season and gave him six RBIs on the night. Harrisburg would get one in the ninth against Erie reliever Mark Ecker when Read homered to left making it 15-7. Harrisburg would get no closer. Faedo (3-6) earned the win for the SeaWolves allowing three runs on four hits with two walks and five strikeouts in five innings. Crowe (0-5) took the loss for the Senators allowing nine runs, five earned, on seven hits with five walks and three strikeouts in 4.1 innings. The SeaWolves return to UPMC Park on Friday night as they take on the Akron RubberDucks at 7:05 p.m. Friday night, the first 1,000 fans (Ages 15 & older) will receive a SeaWolves adult replica jersey. Fans can enjoy $3 specials on select domestic draft beers exclusively in the Bud Light Beer Garden until 7:05 p.m. Before the game, meet C. Wolf and a SeaWolves player in the Team Store to get an autograph.